In the Museum District, Binz is the neighborhood north of Hermann Park that is home to the majority of the city's museums. It is nestled between downtown and the Medical Center. Historically, the neighborhood was separated from the Riverside area during the 1970s with the construction of Highway 288. Binz is a district of large homes, small apartment buildings and scattered commercial buildings. Many of the pre-World War II buildings have been renovated and new residential construction is underway. 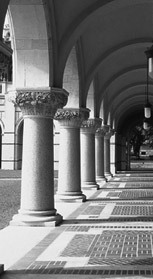 The Medical Center Area includes the original campus of the Texas Medical Center, Hermann Park, from which it was carved, and a fringe of private development. The Texas Medical Center itself has expanded its campus far beyond the original site north of Holcombe and east of Fannin, and has replaced the early restaurants and shopping centers on Main Street with high-rise hotels, outpatient clinics and professional buildings. Hermann Park, home of the city’s zoo, amphitheater, and Museum of Natural History is bordered on the north by several high-rise condominiums, a private hospital and a medical museum.